﻿ Fire on Dark Water - Aarrgh! Tales of daring pirates have captured the popular imagination ever since Daniel Defoe’s The Life and Strange Surprising Adventures of Robinson Crusoe, and Robert Louis Stevenson’s Treasure Island. 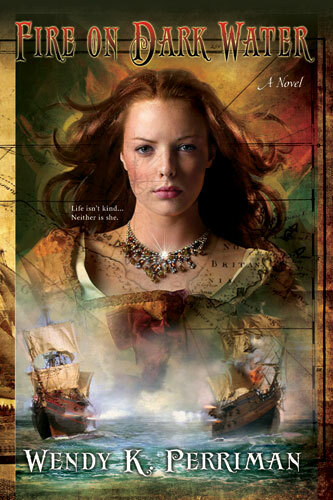 Meanwhile, many feminist readers have pointed to Anne Bonny and Mary Reed as historic examples of tough, proactive heroines battling against the patriarchal practices of their day. But carried away by such ideology we often lose sight of the fact that most buccaneers were greedy, bloodthirsty killers with addictive or pathological natures. So, whereas previous novels have tended to sanitize their lifestyles, Fire on Dark Water is a violent, realistic portrayal of the lascivious, often manic events, acted out by dangerous drunk individuals with little left to lose. This novel examines the essence of piracy. What drove these seafarers to attack and loot fellow sailors? Was “A short but merry life” worth the risks? Why did the buccaneers flourish in the Caribbean during the Golden Age of Piracy? How was piracy finally eradicated? And what type of women would be attracted to this arduous lifestyle? In my attempts to answer these questions I have interwoven a number of psychological strategies so that the story can be enjoyed on multiple levels. Lola takes us on an epic journey from her early Romany childhood, to loss of innocence in the slums of London, a horrific voyage on a white slave ship, indentured servitude on a Charleston rice plantation, life in a brothel on the ‘Pirate Republic’ of New Providence, and ultimately aboard the Queen Anne’s Revenge.